My third short story, inspired by a flash fiction challenge. For more details, see the original post. From her perch atop Saint Patrick’s Cathedral, Gwyn and her siblings waited for sundown. It was her favorite moment of the day when the sun sank below the horizon and the immobility spell that held her in place fell away at the same slow pace. She could feel herself coming alive as each part of her was released. It slid off her first at the tips of her wings, then slithered down over her shoulders, head, chest and back until finally what she thought of as her invisible net seemingly slipped back into the stone beneath her talons. She heard her brothers and sister sigh at the feeling of freedom, and she too reveled in it. Today was the winter solstice, and they would have nearly eleven hours of freedom before the rising of the sun once again called them back to their rooftop and triggered the spell that had held them captive for seven hundred years. She flexed her front and back talons, and heard the satisfying groan of the marble as it gave slightly under her strength. Next, she shifted her shoulders and extended her wings, laughing softly when one of them bumped into her brother’s as he did the same. Finally, she slowly stood on her back legs, feeling her muscles lengthen and stretch as she rose from her seated position at the corner of the roof. She, her sister Galla, and their two eldest brothers Griffin and Gadriel had been lucky in their placement on the corners. Gaspar faced north and Gavyn to the south, while Gregor and Godwyn pulled the east and west duty, respectively. Between the eight of them, all of Dublin lay within their jurisdiction. “Everyone alright?” she called out, her clear, soft voice easily heard in the quiet evening. She received a chorus of ayes, and one ripe curse from Gaspar at her right. She heard him mutter something uncomplimentary before he launched himself into the air to join the others who were already becoming airborne. Gwyn spread her wings and vaulted into the air. She gained altitude quickly, then turned and headed for her duty assignment near O’Connell Street. Intending to stay aloft to enjoy the night, she circled lazily, watching and waiting. She heard fury in Griffin’s voice, which didn’t bode well. Gwyn flew higher then banked left, rocketing toward the edge of the city. She could sense her other siblings in the area, but couldn’t see them in the skies. As she approached the park, she saw flashes of light in the distance. Muttering curses that would make Gaspar proud, she approached cautiously, sliding out her sword from its sheath between her shoulder blades as quietly as she was able. 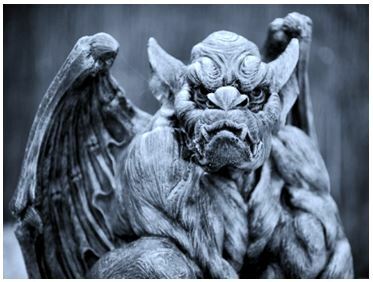 There hadn’t been a battle between gargoyles in over five centuries, not since her parents had quelled the Northern Uprising in 1428 and left them orphans. Her grip tightened. She wasn’t losing any more family. Not tonight, not ever. As she descended, she could hear the sounds the battle, and see the brilliant white-hot sparks as weapons met. Gwyn quickly circled the clearing currently serving as the battlefield. She could see the shimmering of the shield someone had erected to hide the battle from humans, and the numerous gargoyles trying to hack each other to pieces. Catching sight of Galla facing off against two attackers while the others fought one-on-one, she tucked in her wings and speared through the shield, heading straight for her sister. When she was ten feet from the ground, she shrieked a battle cry and backwinged hard, knocking one of her sister’s opponents off his feet and in perfect alignment for her to land on him with all her weight behind it. His pained grunt was quite satisfying. “About time you got here!” Gregor hollered as his fury-filled swing carved a deep furrow into the chest of his adversary. “Yell at me later. Shut up and fight now!” she returned, winging up into the air as her own foe tried to chop off her feet. Gwyn kicked him in the face and onto his back once more, a couple of quick flicks of her wrist slicing up his wings so he stayed earthbound. Shrieking, her challenger pressed forward, trying to find an opening in her defenses. She found the one she needed in his first, parrying the slightly off-kilter thrust of his sword and slipping her own under his guard to spear him through the chest. With another shriek, the scarlet-tinted gargoyle shuddered and exploded into a fine marble mist. Spinning to see how the rest of her family fared, she witnessed two of her brothers taking out their enemies in the same manner she had, and Godwyn struggling under the fierceness of his much larger opponent’s attack. She leapt high and landed on the attacking gargoyle’s shoulders, digging her talons in deep and grabbing hold of his wings. His assailant effectively immobilized, her brother wasted no time. He shoved his sword into the other’s heart with everything he had, and both brother and sister coughed as their foe disintegrated. “ENOUGH!” roared Griffin with a massive kick that had his opponent’s sword flying into the night, and another that sent him sprawling into the center of the clearing. The red gargoyle struggled to his feet only to be knocked back down when his last remaining ally slammed into him, having been thrown by a seriously pissed off Gaspar. The two confederates slowly rose to stand back-to-back, watching warily as they were encircled by Gwyn and her seven siblings, their wings outstretched and creating an effective barrier to escape. “Who are you? Why do you do this?” Griffin demanded as he stepped inside the circle. “You do not recognize us?” the smaller of the two said. “You are of Vermilion clan,” Gadriel stated. “Our father,” whispered Kyran. Griffin thrust Kedric away, Gadriel and Gavyn grabbing hold of him, and turned to the younger sibling. Nodding to Gadriel and Gavyn, they released their captive. The scarlet brothers backed away, taking to the air and headed east toward the northern counties. Gwyn and her siblings sheathed their weapons, and she walked over to where the shield orb sat. Depressing the switch, she deactivated it before tossing it to Gregor. Griffin motioned for them to get airborne, and she waited with him until all were safely away. “Splendid,” she muttered as they rose into the air.